In this intensive four-day workshop we will work on critiquing and revising your work to bring it to a more complete and polished form. We will read each other’s work in advance, and spend the mornings in critical discussions. It is not unusual for a work to be heavily revised as a result of workshop discussions. There are no limitations as to genre or subject matter. This workshop is intended for advanced writers. Admission will be based on a writing sample. To be considered, submit a work sample of no more than 15 pages as a single word document to miles[at]kwls[dot]org with “Stone Workshop Submission” in the subject heading. 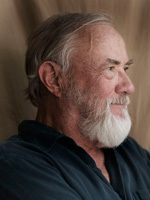 Robert Stone is the acclaimed author of several novels, a memoir entitled Prime Green, and short story collections including, most recently, Fun with Problems. His novels include Dog Soldiers, for which he won the National Book Award in 1975, A Flag for Sunrise, winner of a 1982 PEN/Faulkner award, Damascus Gate, and Bay of Souls. His 1997 short-story collection, Bear and His Daughter was a finalist for the Pulitzer Prize. He has received a Guggenheim Fellowship and taught at universities including Yale and Harvard. Stone lives with his wife, Janice, in New York City and in Key West, where he serves as an honorary director of the Key West Literary Seminar.